This entry was posted in Alumni, Campus Announcement, Community, Events, General News and tagged oaks, Toomer's Corner on February 1, 2013 by Wire Eagle. AUBURN UNIVERSITY – Auburn University and the City of Auburn will host a “Celebrate the Tradition” block party at Toomer’s Corner on Saturday, April 20. The event will be held after the A-Day football game and will give fans one final opportunity to roll and photograph the beloved oak trees before the trees are removed. 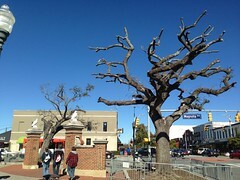 A date for the trees’ removal has not been set.